Fashion is so cyclical while great style is timeless. Brandistas, you know I have a rather classic style leading me to collect traditional staple pieces season to season and keeping them for years. While I welcome ways to refresh and keep my street style on-trend by making sure a few of those gems are trendier each season, I’m very mindful of the pieces I will still love and continue to rock. In typical ‘classic’ girl fashion, something about the beautiful bold plaids and other throwback prints like polka dots and paisley met me with some resistance. Perhaps because I wore the ‘he#l’ out of plaid throughout the 80’s and 90’s rushing my mind back to vivid memories of an overload of plaid blazers (a particular yellow one) and pleated skirts from the Clueless days circa 199o’s. Somehow someway, both a remix of pleated skirts and plaid have trickled back into my wardrobe lending my 2017 fall fashion looks to be a complete homage to the 90’s. I’ve digested it as chop as the nostalgia element of styling repetitive fashion and going with the flow. Our personal style is truly timeless; the cuts, colors, and fabrics that we love will mainly remain the same- strongly imprinted in our fashion DNA. Yet, how we style those fashion pieces in our everyday street style gives us the liberation of expressing our own personal style by refreshing and renewing; not only season after season but year after year, and now decades later. So for classic girls who have great style but are less trendy, embrace it but have fun because those same ‘classic’ pieces will continue to reinvent themselves and provide you with all the ammunition to stay fabulously classy + chic all at the same time! From trousers to dresses, to wool hats and blazers, plaid is the of the moment pattern I’ve finally re-embraced. 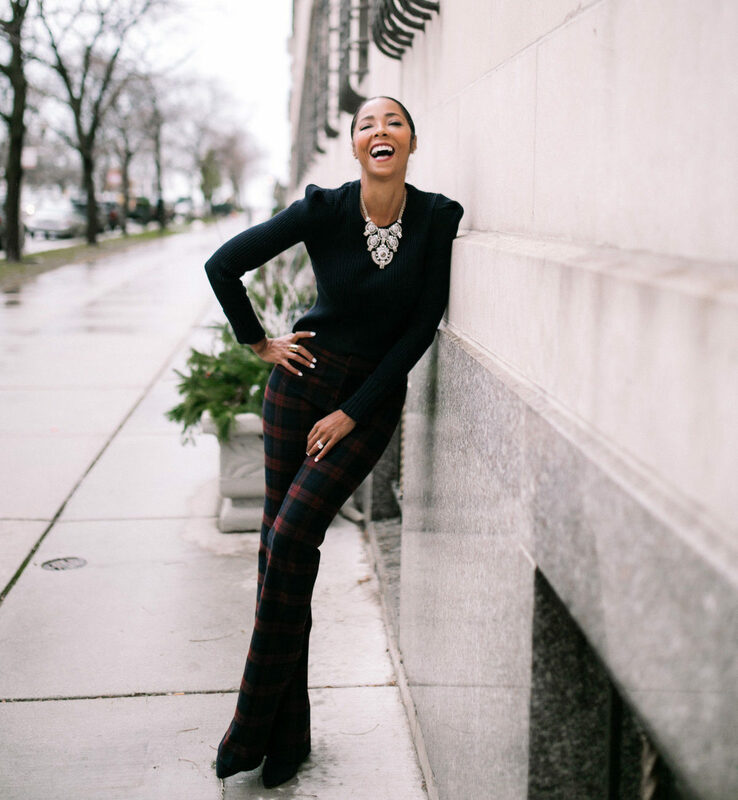 And for me, the return of a retooled plaid flannel pant transitions into an instant update from more traditional trousers, giving them a modern remix that guarantees you won’t be left to feel you’re rocking your grandma’s plaid. Granted my grandma was super fly, I’m swapping out my traditional slacks for a slightly higher-waisted, floor-sweeping plaid in a duo of the season’s hottest colors of rich burgundy and deep blue. Opt for whatever rich color duo or trio fits your style fancy, It’s an easy way to dial-up your 9-5 staples and livens things up through the holidays. 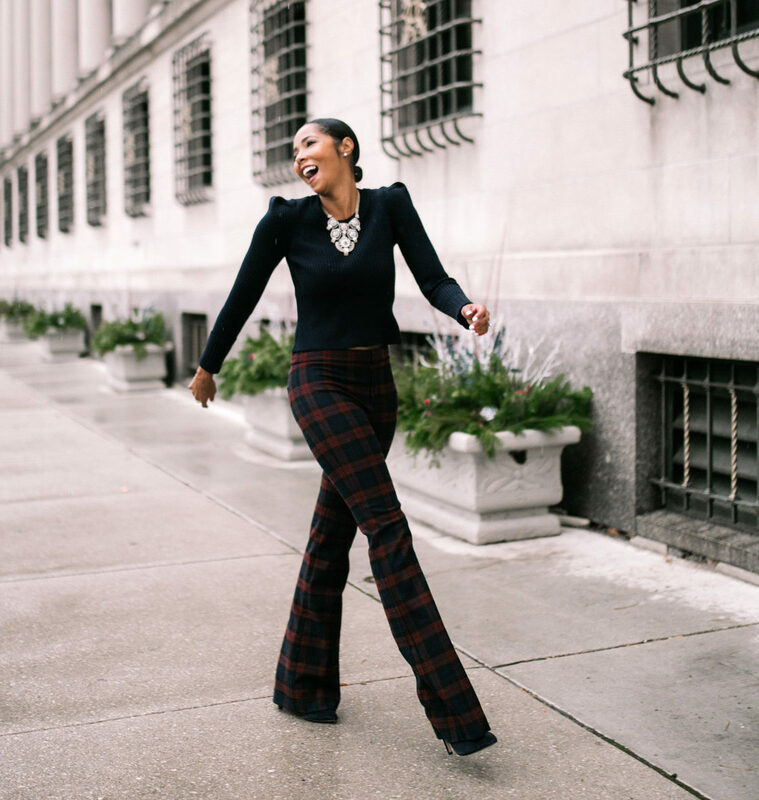 For today’s street style, I’m having way too much fun with these flat fronted Derek Lam plaid flannel pants, and there are no limits to how casual or funky they can go. There’s no limit with these babes. From wearing them down with a white v-neck t-shirt under a comfy denim jacket to office chic for a typical day in the office and running errands; to transitioning her for a festive evening out for holiday drop-ins. These daytime pants have great night-time appeal too. I’m down for playing up textures and bolder colors this fall so I’m looking forward to switching them up for an evening out, trying them with my burgundy fur vest and a gorgeous Gucci suede purse real soon, so stay tuned for that fashion look. 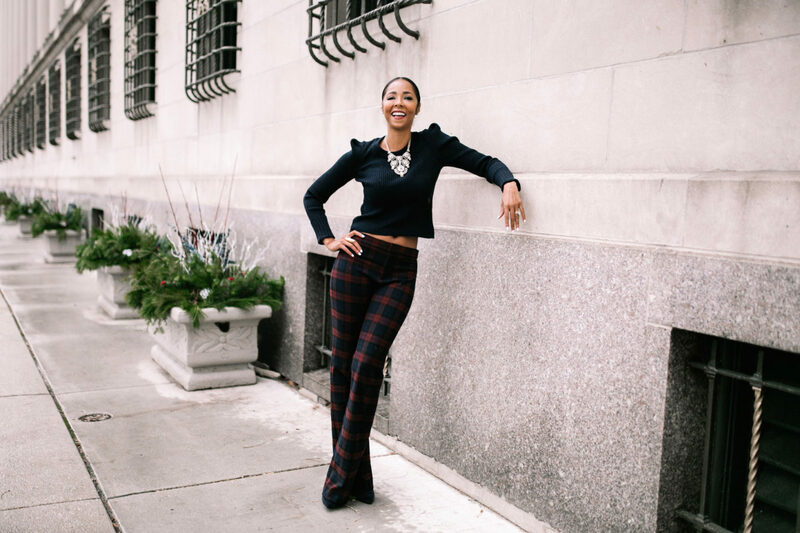 Pleasantly surprised, the street style look was nothing like my 90’s get up and I love it, I’ll be remixing the pieces and will certainly do a follow-up post wearing the pants for a swanky Chicago evening out. Such cool pants, love this outfit! It seems that what’s old is new all over again.